Bearbook will take care of all your complex accounting stuff so that you can focus on business. Bearbook online accounting software have great features that will simplify all your accounting activities. 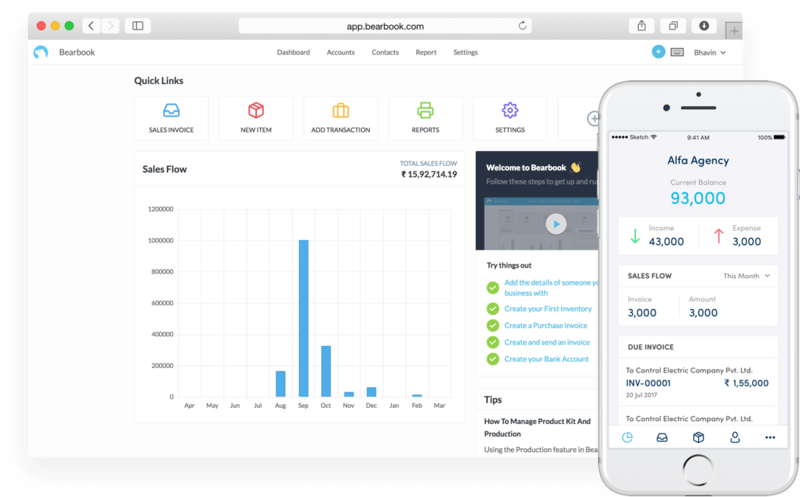 Bearbook online accounting software is as simple as Whatsapp or Gmail. Simply create an account and start using it. Using Bearbook GST accounting software you can create online GST Invoice as well as create reports that help you to file GSTs. Online accounting software for Data-Driven Businesses. Accounting software helps you to know where your money is going, what your margins are, and how your departments are performing. No upfront setup costs, no long-term commitments or no extra charges. The small business owner can take advantage a regularly growing suite of organisational software and technologies to less the cerebral pains of managing receipts, bills, and invoices while expanding the time spent seeking after new business openings. Choosing the right accounting software for small business is not as simple as majority people think. With the opportunity to cut overhead by up to 75% with the small business accounting solution. Regardless of a large move from desktop to cloud accounting software in recent years, despite everything we get inquired as to whether a cloud is a right solution for their business. To try and answer this inquiry we will take a gander at major parts of your accounting software and comparison between desktop and cloud accounting software.